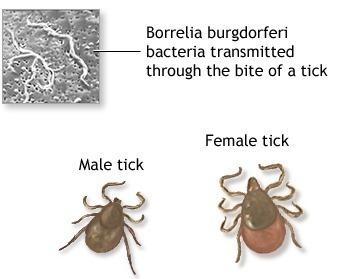 Lyme disease is caused by the spirochete shaped bacteria Borrelia burgdorferi and Borrelia mayonii. It is transmitted by the bite of a deer tick. For a number of reasons Lyme disease is frequently misdiagnosed or missed entirely. About 50-75% of patients recall having had the characteristic bull’seye rash. Fifty percent of patients don’t even recall having had a tick bite. In addition, the ELISA test that is commonly used for screening is only 65% sensitive, thus missing 35% of cases. An additional 20-30% of culture-positive proven Lyme patients show negative results on the Western Blot test, in part due to oddities in the criteria mandated by the CDC in reporting the results. The early localized stage may present with the characteristic bull’s eye rash. The second or early disseminated stage occurs weeks to months after the first stage. At this point the infection has spread to other parts of the body. The late stage begins months to years after the first stage in untreated patients. According to the CDC “early recognition and treatment of the infection decreases the risk of serious complications.” Lyme Plus is the ideal formula to provide relief from tick-borne infection symptoms, such as fatigue, painless rash, muscle aches, joint pain, headache, and fever. The signs and symptoms of many tick-borne diseases are similar. Because the symptoms of Lyme disease are wide-ranging, it is known as the ‘great imitator,’ and can be mistaken for many other illnesses. The presentation of the early disseminated (second) stage is similar to that of the flu, with fever, muscle aches, joint pain, fatigue, and in some cases a recurrence of the characteristic rash in new locations. About 15% of patients experience nervous system involvement, such as Bell’s palsy,and 8% have myocardial abnormalities. The best protocol that we've found to treat Lyme is through DesBio. They are the only company taking a homeopathic series approach to this very confusing disease. This protocol consists of Series Symptom Relief Kits that offer relief from the symptoms of Lyme. The DesBio Series Symptom Relief Program is a homeopathic program designed to support the immune system by helping your patient temporarily relieve symptoms associated with chronic infections. Unlike other chronic infection programs that simply work by strengthening the immune system, this program works by providing specific homeopathics that are tailored to individually address symptoms of some of the most common infectious agents, like Lyme. Utilizing all five of these components is necessary for your comfort and success during this protocol. After completion of the basic protocol, it may be necessary to continue on with Series 1M and 10M Kits. The protocol can be individualized for specific symptoms and Desbio has covered as many bases as possible in regards to the daily struggle that Lyme sufferers endure. These kits have very specific dosage instructions and must be followed correctly to be effective. 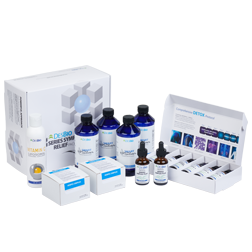 Desbio also offers a Series Package that includes most everything you might need on your Lyme journey, as well as kits for common co-infections, like Bartonella. Lyme Plus: Helps manage symptoms associated with Lyme disease and offset clearing reaction symptoms. May also be beneficial in supporting patients with Ehrlichia. Borrelia Homochord: A homochord of the borrelia dilutions that can be used after series therapy is completed or during therapy on "off" days to help offset clearing reactions and support the immune system. Intestinal Restore: Helps supports the gut and provides a therapeutic dose of immunoglobulins to help boost immune defenses and balance immune over-stimulation. ProDefense: General immune support formula that can be used throughout the protocol. Quercetin and curcumin might help offset clearing symptoms and balance inflammatory responses. Astragalus helps boost immune defenses. Prebiotics and probiotics restore gastrointestinal immunity, and mushrooms help promote cellular longevity. PathoGuard: Blend of ingredients to help the body eliminate pathogens. Wormwood may be effective against babesia. Oregano oil is a multifaceted natural anti-microbial that may help diminish infectious agents. Monolaurin helps immune cells attack pathogens hiding under a protective lipid bilayer. Vitamin C Liposomal: High-dose vitamin C with liposomal delivery to help boost immune defenses and balance inflammatory activity. May be especially beneficial in patients who are detoxing heavy metals. Liposomal Methyl B: Methylation is crucial for many body processes and essential for detoxification. Genetic MTHFR mutations are common in patients suffering from chronic illnesses. Bioactive B vitamins in a protective liposomal delivery system may be the best method for supporting these patients. D3-K2 Lipsomal: Vitamin D is essential for the immune system and in combination with K2 helps support healthy bones and teeth. K2 may help decrease the integrity of pathogenic biofilm. Liposomal Glutathione: Low levels of this essential antioxidant can increase the risk of damage from chronic illness. Supplementing with a liposomal form of glutathione is a more direct way to increase glutathione levels. Magnesium Liposomal: Hundreds of body enzymes are dependent on magnesium, and deficiency is common in chronic patients. Other forms of magnesium may cause bowel disturbances, but liposomal delivery avoids these issues. Resveratrol-Curcumin Liposomal: These two potent antioxidants have poor bioavailability unless given in a liposomal form. Research suggests that this combination may help balance Th1/Th2 function to help suppress immune hyperactivity.